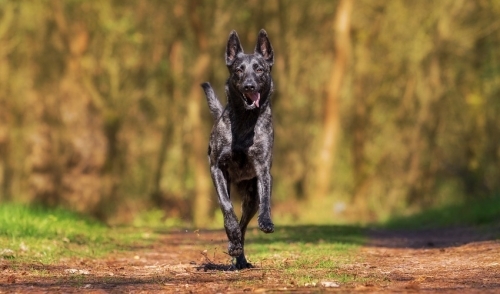 By nature, all dogs are evolved as carnivores, biologically adapted for a diet rich and varied in fresh meats with smaller amounts of fruits, vegetables and grasses. That’s why ACANA Chicken & Burbank Potato is loaded with cage-free Cobb chicken and whole eggs from local prairie farms, wild-caught flounder from Vancouver Island, and Okanagan Valley fruits & vegetables – all delivered fresh each day to nourish your dog completely. Featuring cage-free duck as the sole source of animal ingredients, ACANA DUCK & BARTLETT PEAR is a unique Limited Ingredient and Biologically Appropriate™ diet that’s perfectly suited to diet-sensitive dogs of all breeds and life stages. 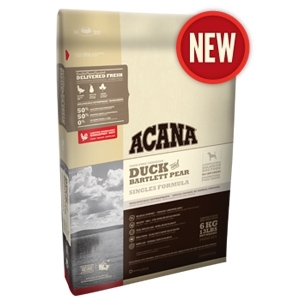 Loaded with cage-free Canadian duck — delivered fresh in richly nourishing WholePrey™ ratios that include flesh, liver, fat and cartilage, ACANA supplies nutrients in natural whole food form, dramatically reducing the need for synthetic ingredients. 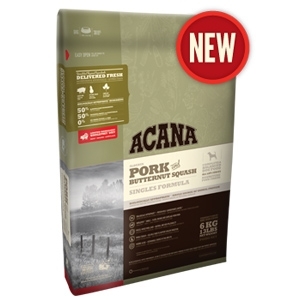 Infusions of freeze-dried duck liver naturally enhance palatability for selective eaters. 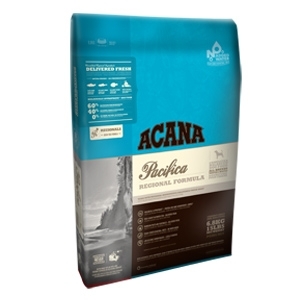 ACANA‘s fresh meat diversity mirrors your dog’s natural diet, and generous infusions of New Brunswick herring promote his peak conditioning. 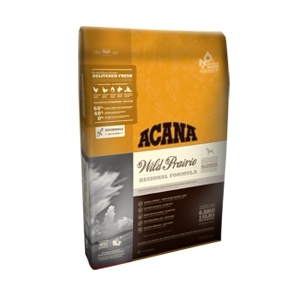 Grain-free to reduce unwanted carbohydrates, ACANA features local fruits and vegetables for a rich, natural supply of phytonutrients. Reflecting Alberta’s ranching heritage, ACANA Ranchlands is loaded with local red meats, including Angus beef, lamb and bison all free-range and delivered fresh each day to nourish your dog completely. Rich in meat proteins and grain-free to reduce unwanted carbohydrates, ACANA Ranchlands features fresh fruits and vegetables including Burbank potatoes, pumpkin, Red Delicious apples and spinach greens that provide your dog a rich source of phytonutrients. Alberta’s vast prairies are renowned for the diversity of world-class foods produced in its rich fertile soils and cold northern lakes. Reflecting our prairie heritage, ACANA Wild Prairie features cage-free Cobb chicken and whole eggs from local prairie farms, and wild-caught fish from our cold northern lakes – all delivered fresh each day!